A simple yet stylish, IP44 rated outdoor wall light with a slender curved edge, flat panel lamp holder with top and bottom frosted polycarbonate diffusers to wash the wall with light above and below. Simple to install, compact in profile and supplied fitted with 10w of energy efficient, cool white LED lighting to help reduce running costs, making it a excellent choice for lighting most outdoor social spaces. Covered by a comprehensive three year manufacturers finish guarantee. 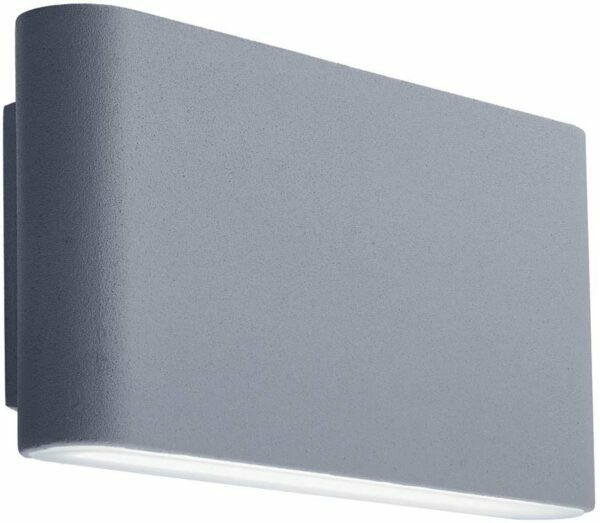 Please note that there are no other products that match this modern outdoor LED wall light. Hello Ged and thank you for getting in touch. There was a mistake on the dimensions that has now been corrected. This LED outdoor wall light is 91mm high, 170mm wide and projects 42mm out from the wall.